The Hammersmith Club meets for a meal in the POSK building near Ravenscourt Park Tube station weekly for a meal to socialise, discuss and plan events. Being part of Rotary is more than just giving back to the community. It is also about you bringing your skills, experience and enthusiasm to help it thrive, whilst making some great friends along the way. Our clubs are friendly places which invite speakers from a wide range of backgrounds to share their knowledge, increasing your social and cultural understanding. We are 1.2 million volunteers working together to create positive, lasting change in our communities and around the world. Our differing occupations, cultures, and countries give us a unique perspective. Our shared passion for service helps us accomplish the remarkable. We are always looking for new members and with more input we can accomplish even more. Last year we had a small concert and raised funds for London air Ambulance. Gurcharan Singh Vig, a Hammersmith Rotarian, was so moved by the devastation caused by the 2004 Boxing Day Tsunami he decided to help. Vig went to Sri Lanka in 2005 and has been back every year since. 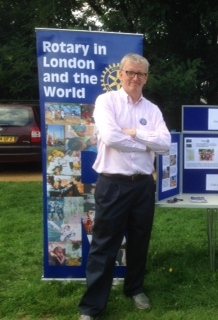 In that time he has helped hundreds of people in the southwest of the island and The Rotary Club of Hammersmith has been pleased and privileged to be able to support his efforts.Vig ‘s work has been in at Beruwela in the southwest of Sri Lanka. What had once been a beautiful beach resort and fishing harbour was now a disaster zone. He helped the people repair their boats, he boughtessential items like beds and mattresses. Next he workedwith local schools and orphanages and has even built a school for infants. And ten years after theTsunami the work is still going on. Thames Water (TW) have a very effective propaganda machine. 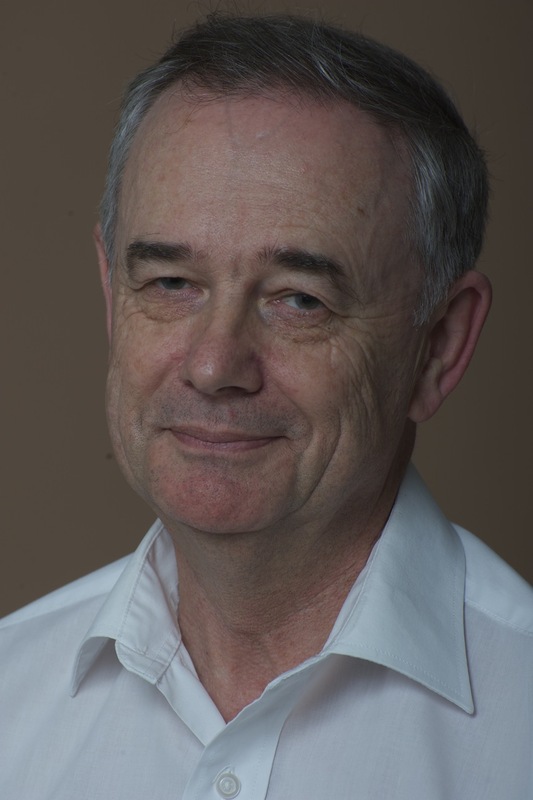 They want to build the so-called ‘Super-Sewer’, partly because they have put a lot of work into planning it, and partly because it will bring hefty financial profits to their owners and stake-holders. So they have devised a set of myths which have persuaded the people who matter (i.e. the Government) to give them the go- ahead. But when you understand the truths behind the myths, you see that it is not so super at all. Indeed it should not be allowed to proceed. Myth 1: It’s called the Super-Sewer. Its real name is The Thames Tideway Tunnel (TTT). TW invented the nickname ‘Super-Sewer’ and it has served them well. It makes it sound a good thing: sewers are essential to healthy and civilised life, so a Super Sewer sounds just what we need. But it is only ‘super’ in the sense of grotesquely large; as we shall see, it is certainly not ‘super’ in the sense of good or desirable. And indeed it is not primarily a sewer either. It is intended to take the overflows from the sewers under our homes and roads, and stop them spilling into the River. But these overflows only happen when there is heavy rain. The excess fluid the TTT will carry will be only 5% sewage, 95% rainwater. I never call it the ‘Super-sewer’; I call it the Rain Drain. My friends who rightly object to its astronomic cost call it ‘The Great Drain Robbery’. Myth 2: We need it. with a radius as far out as Hammersmith and Fulham (H&F). Outer London was built later with more modern drains that separate sewage from rainwater at source, and so have no problem. The population growth of the last 100 years has occurred in outer London, not inner. Inner London actually has fewer people living and working in it than when the sewers were built. If you live in a Victorian house, compare how many people lived in it originally with how many now, and you will see the point. Myth 3: It’s the only way to deal with the excess rain. The overflowing rain is of course a serious problem; but the TTT is an inflexible way to deal with it. TW admit themselves that on average four times a year the rain will be SO heavy that even the TTT will overflow. And meanwhile it will sit idle for 305 days a year, six days every week. If only there were a more effective solution! And – despite TW’s dismissals – there is. It is called, for short, ‘Green Infrastructure’ (GI). It is a combination of measures designed to stop the rain getting into the sewers in the first place. It includes green roofs and walls (vegetation that soaks up the rain); rain harvesting to water the trees in parks, pavements and playgrounds; sustainable drainage (already being applied to most new developments) where waste-water is recycled and re-used; porous road surfaces that allow the rain to soak through to the earth and underground rivers. Philadelphia has pioneered the approach; it has become standard best practice in USA, and is being adopted in New York. European cities are following. Myth 4: GI wouldn’t work in London. made porous, rain overflows would already be finished. Even without this one dramatically effective measure, GI will remove the overflows within 25 years (perhaps as little as 10) of the TTT opening. Why build a white elephant? Myth 5: There’s nothing we can do about it. Public inertia suits TW perfectly. The Government in their folly failed to review this policy inherited from Labour. They have simply accepted the myths and given it the green light. Most people think nothing now can stop it. Well, think again. Already the cycling fraternity have learnt that their Super Highway, new in 2015, will be closed again in 2016; there will be other groups opposing the disruption the TTT will bring in its wake. At least two Councils (one of them H&F) are considering referring the inadequacies in the whole process to Judicial Review. If you live in H&F, write to the Leader of the Council (Stephen.Cowan@lbhf.gov.uk) urging him to do it. If the TTT goes ahead, you will be paying for it in increases to your water bill (rising to £80p.a.) for the rest of your life. It is certainly not too late to write to the Government Departments responsible (DEFRA and DCLG) to say their decision is unacceptable; there may well be a petition starting up to this effect. There is something called a General Election next year; there could well be a change of Government, ready to reconsider this decision of its predecessor. Don’t take my word alone for all I have said. The evidence for it is detailed in the website http://www.cleanthames.org. 63 per cent agreed. 12 per cent disagreed. There were big majorities of Labour and Lib Dem voters who agreed. But I’m afraid the Labour MP for Hammersmith Andrew Slaughter does not believe in allowing the English a fair democratic opportunity for deciding the laws we live under. 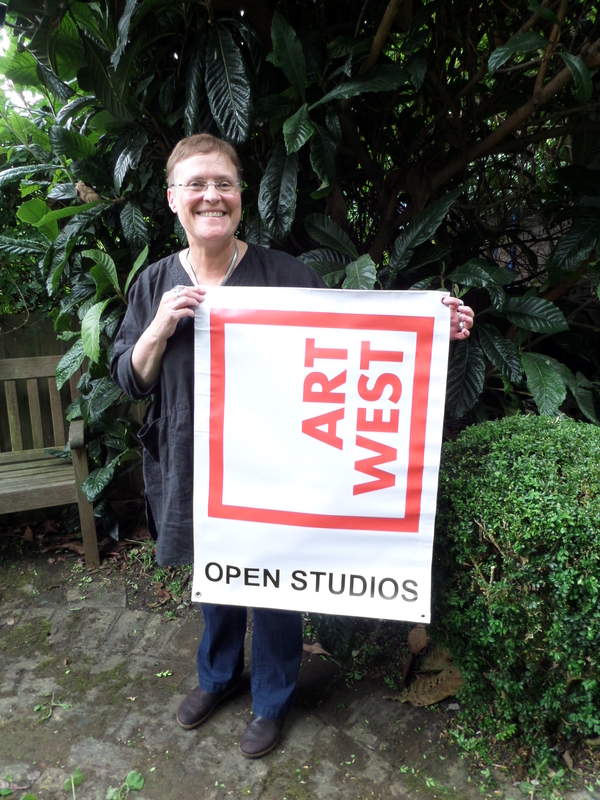 For the fourth successive year, the barren streets off Scrubs Lane, usually dominated by Car Giant, are coming alive with the banners and red and white balloons that signal the ArtWest Open Studios weekend. In between the second hand cars more than 50 artists in six buildings will be opening their doors to the public, offering a rare opportunity to visit and talk to artists and makers in their own domain. I’m one of those artists and one of the organisers. (All the organisation is done by the artists, on a voluntary basis. We have been helped financially this year by two London Boroughs – Hammersmith and Fulham and Brent – as well as the art supply chain, Cass Art). Artists are usually quiet people, often working in isolation, and rarely discussing their work with members of the public. 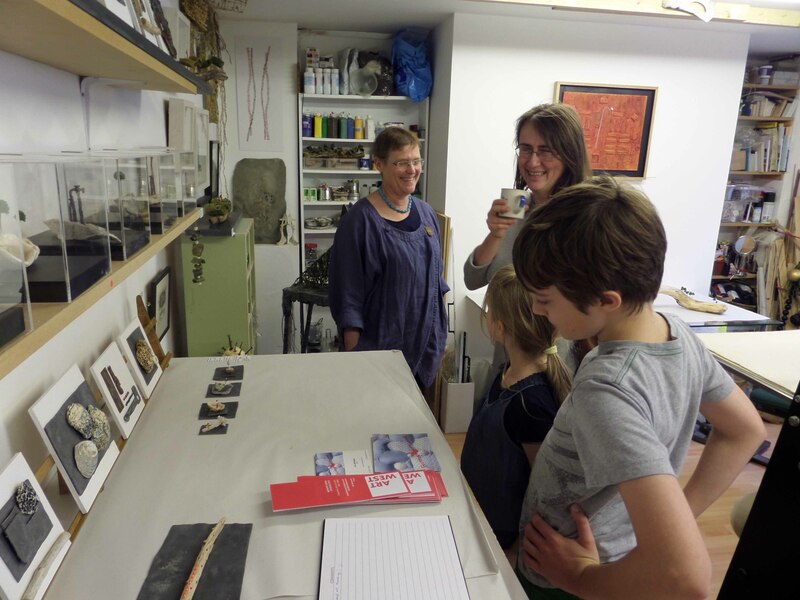 But for this annual event, the artists taking part are usually delighted to chat with visitors. Their work includes painting and sculpture, glass making and ceramics, print making and photography – even artefacts made of cork. It’s a wide range of work, and a wide range of people. There are at least three Latin American artists (from Bolivia, Argentina and Venezuela), four makers of beautiful glass, a Trinidadian whose objects evoke the sunshine of the Caribbean – and the art itself ranges from representational portraits and landscapes to vibrantly coloured abstracts and weird objects! (I make a lot of weird objects myself – often putting together pieces of wood and other material found on the beach or in the street). There will be items for sale in most of the studios, and for the second year running, we’ve made it possible for prisoners in Wormwood Scrubs to contribute their own postcard-size pieces of art to the Postcards from ArtWest sale (in the Acme building). This little exhibition offers miniature gems produced especially for the weekend and on sale at £20 a piece – but you won’t know who the artist is until you are sent the work when the weekend is over. A chance not only to own your own work of art, but also to invest in the future! I’ve taken part in all four open studio weekends, and I love them. Visitors range from the art savvy to those who have never been in a gallery or museum or met an artists – and few of them hold back in offering their views or asking questions. For the artist, being in his or her own studio offers a safe environment to deal with feedback, which is not always flattering! Children seem to enjoy these weekends, and often come up with the most perceptive comments. 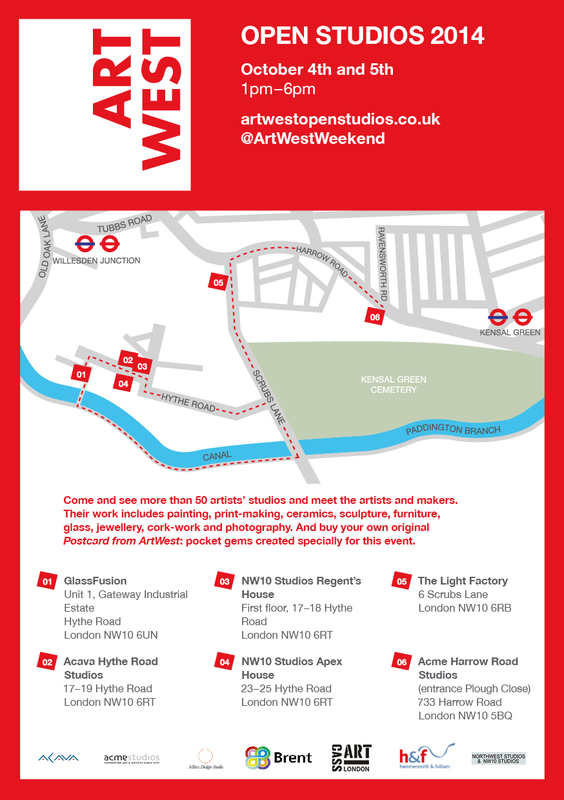 Further information and a map can be found on www.artwestopenstudios.co.uk and you can follow ArtWest on twitter @ArtWestWeekend. You’ll see from the map that it’s possible to combine the studio visiting with a walk along a stretch of the Grand Union Canal. But put your walking shoes on, it’s about two miles from one end of Hythe Road to the Acme Studios in Harrow Road. I just read the piece by Harry Phibbs about the streetscene improvement works in Goldhawk Road, which includes pavement widening. Clearly there there are a number of real benefits, both practical and aesthetic from these schemes, though you are right to draw attention to the potential costs from increased congestion, especially as London continues to struggle to achieve satisfactory clean air standards. I am concerned that we are failing to take a holistic and fully imaginative approach to upgrading the ambiance of streets like Goldhawk Road. What I always notice when travelling from Holland Park into Shepherds Bush is the sudden proliferation of security shutters in front of shops, and satellite dishes covering frontages – classic indicators of blight and underperformance. On a Sunday morning the eastern section of Goldhawk Road can feel like a conflict zone in post-curfew lockdown. 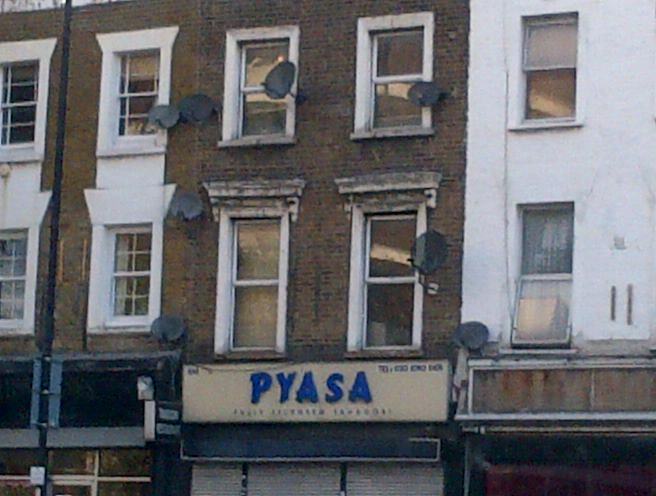 Ugly metal shutters cover more than half of business premises, and satellite dishes bubble and pustulate from the front faces of what were once attractive historic buildings. Relocating satellite dishes to more sensitive sites on a building is not that expensive. Neither is removing an external security shutter or replacing it with a much less obtrusive open-linked internal grill. The challenge lies in the fact that these are usually on private property where the council lacks powers. But if we are spending nearly £4 million on new paving and street trees, surely it is worth spending a little more to achieve a genuinely good result. In fact I would argue that the first tranche of any street improvement budget should always be spent trying to remove satellite dishes and security shutters, via grants or access to pre-funded council contractors. 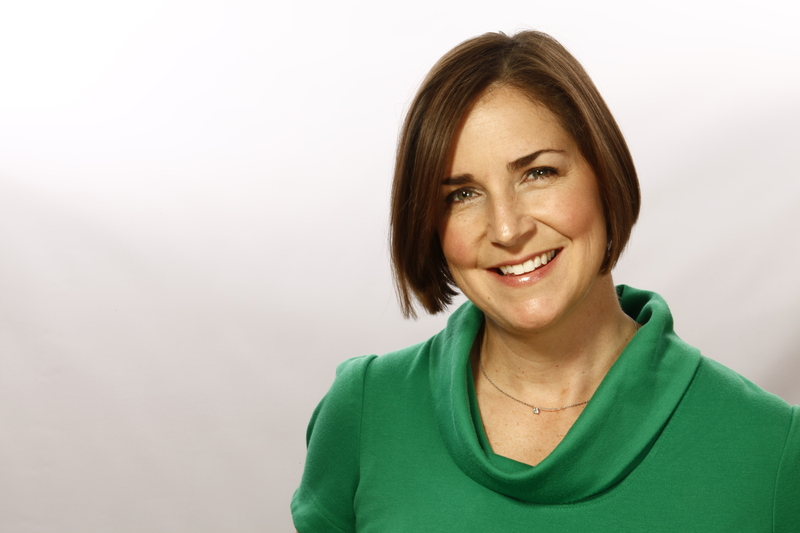 Nicole Jacobs: What is Standing Together? Standing Together is a charity based in West London that coordinates the local approach to domestic violence and also does work nationally and internationally. Launched more than 13 years ago, Standing Together works to promote a co-ordinated, multi-agency community response to domestic violence. This approach recognises that no one agency can tackle domestic violence effectively if acting alone. Without effective coordination of activities between agencies, responses are less effective and survivors of domestic violence are still at risk of falling through the gaps in the system. The coordinated partnership model enables all the relevant agencies to identify and respond successfully to domestic violence. We work together with statutory and community organisations – from criminal justice agencies to children’s services and refuges – to ensure that victims and children are safer, and perpetrators are held to account. We also influence national policy and practice by initiating and driving innovation in providing safer options for women and holding perpetrators accountable. We have influenced national and local government and ensured a better response to domestic violence. As a result, significant and positive changes have occurred in the provision of special courts and enhanced expert services and policies aimed at reducing the risk to women. We act as the domestic violence coordinator for Hammersmith & Fulham. What is unique about us is that we have divided the role of the coordinator – so we have a dedicated Maternity Coordinator, Children and Health Coordinator, Specialist Domestic Violence Court Coordinator, MARAC (multi-agency risk assessment conference) coordinator, Housing coordinator. Our work is not only limited to H&F, but we also work within the tri-borough (K&C and Westminster) and have MARACs in the tri-borough as well as in Brent, Ealing and Haringey. For more information, please visit our website www.standingtogether.org.uk.